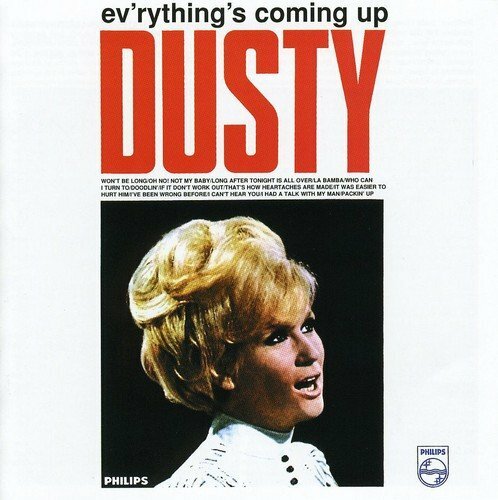 Full title - 'Ev'rything's Coming Up Dusty'. Digitally remastered reissue of her second solo album, originally released in 1965 & featuring songs written by Burt Bacharach, Hal David, Randy Newman, Anthony Newley, & Rod Argent. 21 tracks total including eight bonus tracks, 'Live It Up', 'I Wanna Make You Happy', 'I Want Your Love Tonight', 'Now That You' My Baby', 'Guess Who? ', 'If Wishes Could Be Kisses', 'Don't Say It Baby', & 'Here She Comes'. Mercury. 1998.